Welcome to Kamari Beach Hotel, the first hotel of G & E Karamolegos Group. Built in 1972 in the town's swinging center, Kamari Beach Hotel led the way of upscale hotel services in Santorini, giving us 35 years of experience in serving your needs. 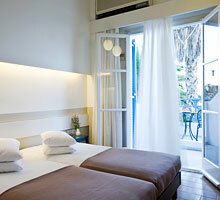 A thorough renovation in 2007 gave a fresh look to the harmonic blend of Aegean style with a 70�s linear design. Placed right on the volcanic black sand beach of Kamari for endless hours of leisure by the sea, Kamari Beach Hotel is a haven of warmth and hospitality, a special place in Santorini awaiting you and your family. 106 spacious single, double and triple bed rooms with a soothing sea or garden view from your private veranda - or choose one of our 2 suites. You can check room availability for the booking dates of your preference, book ONLINE WITH YOUR CREDIT CARD and receive REAL TIME CONFIRMATION. 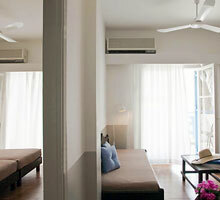 SPECIAL OFFER, Non Refundable, For Single rooms, Twin Courtyard View and Twin Sea view rooms. Get 20% off, Non Refundable, by prepaying the full amount of your reservation 60 days before arrival!